This \'68 GT500 Recreation was built 6 years ago, the previous owner purchased the car from the original builder upon completion. The previous owner only drove the car a few times, pushing no more than 100 miles in total. It\'s powered by a Ford 428ci FE V8 Engine with aftermarket Edelbrock performer RPM heads and the original style Ford intake. This motor is mated to a Tremec TKO600 5-speed and Ford 9 rear end, making a desirable powertrain for any speed enthusiast. Every nut and bolt on this car has been touched in one way or another, so rest assured, this car was carefully disassembled and recreated into the work of art you see today. The interior features leather bucket seats, factory roll bar, shoulder belts, a custom resto-mod floor shifter, and a modernized dashboard with Autometer performance gauges. The undercarriage is a work of art as well, reflecting that every surface was detailed well. 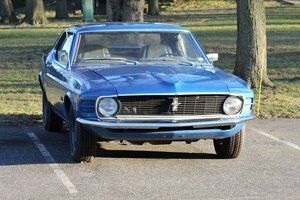 Go to www.vanguardmotorsales.com to see over 100 HD pictures and our in-depth video for this \'68 GT500 Recreation and over 200 other classics! 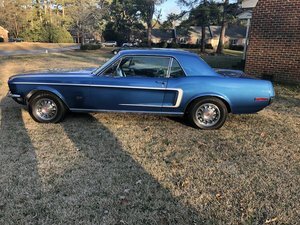 1968 Shelby Unique parts catalog, Holbrook Racing Engines paperwork, and a stack of invoices & receipts from build are included in the sale! Dashboard & Dash Pad Look New! Don\'t Miss Out! Call Tom 7 Days a Week at 248-974-9513!